I suggest you start your drive in Elbe Washington. Its important to look for signs along this route ... they should direct you to both Paradise and Sunrise Park. You will take Rte 706 east till you get to Rte 123 which you take north. Take that till it runs into 410. Now you want to take 410 north towards Sunrise Park road. Look for Sunrise Park road which will be on your left and head west towards the route's end at beautiful Sunrise Point at the Sunrise Visitor Center. The star of this show is the 14,411 ft Mt. Rainier, the highest peak in the entire Cascade mountain range. This mountain is a dormant volcano with a distinctive dome shaped peak that is completely glaciated. You will see many rivers, lakes, canyons and waterfalls often times dramatically and starkly outlined by the dark volcanic rock surfaces. Overall the road conditions are almost ideal for motorcycle enjoyment. Plenty of zigs and zags and long climbs for you to feel the power of your bike. One of the best and most exciting sections of the route will be found as you approach and pass Cayuse Pass as you close in on Sunrise (the final destination of the route). As with any mountain motorcycle traveling, special care has to be taken to avoid late spring or early fall snow conditions. Overall the road conditions are almost ideal for motorcycle enjoyment. Plenty of zigs and zags and long climbs for you to feel the power of your bike. One of the best and most exciting sections of the route will be found as you approach and pass Cayuse Pass closing in on Sunrise, the final destination of the route. As with any mountain motorcycle traveling, special care has to be taken to avoid late spring or early fall snow conditions. Photo contributed by visitor in Jun 09 - "Awesome day @ Sunrise area on Mount Rainier." The town of Elbe Washington is the home station for the Mt. Rainier Scenic Railroad. You can ride this train along its 14-mile roundtrip journey enjoying the thrill of riding an authentic steam powered locomotive and open-air passenger cars and restored coach cars. You will travel to within 25 miles of Mt. Rainier through lush forests. You may enter Mt. Rainier National park via the main entrance, Nisqually entrance, and enjoy a museum and educational trail outline the parks history and points of interest. Further up Rte. 706 visitors can park and take a short hike to see the Narada Falls. It is here where the Paradise River takes a 168 ft dive. Further up the route you will find the most visited spot in the park Paradise. Here you will find the Jackson Visitor Center where you will learn about various mountain fauna and geology. Next on the route you will travel along a section known as Stevens Canyon Road. Along this section you will travel along canyons, see numerous lakes and waterfalls and view the pristine Reflection Lakes offering images of Mt Rainier on their mirror like surfaces. Towards the end of the run you will make your way unto the highest point accessible by motorized vehicles Sunrise point. From here you will take in the most impressive views of the looming Mt. Rainier to the west as well as other peaks among the Cascades. You can also see the largest glacier in the continental United States Emmons Glacier. The Sunrise Visitor Center will offer you more information and appreciation for the majesty of Mt. Rainier. on July 11, 2013 6 out of 6 members found this review useful. Having lived in Puyallup most of my life, I have lived with Mount Rainier in my backyard staring at me ever day. That said I have risen this ride more times than I can count and it is still one of the best day rides anyone could ask for. There is beautiful waterfalls, twisties, mountain views, snow covered hills and valleys, twisties, forests, good places to eat and drink along the way as well. Oh yeah and great twisties! 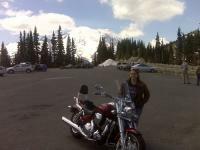 I prefer to start in Enumclaw as well taking HWY 410 just past the 123turn off to the summit of Chinook pass just for the twisties and the amazing view. It's only a couple of miles out of your way, then turn back and hit 123 south. This can be a rougher road and pretty shaded so be prepared to look for the pot holes between the shadows. When you get to the park entrance at the Stevens Canyon entrance my favorite part of the ride begins. From here you climb out of the woods around the Ohanapacosh river and up Stevens Canyon. Some sharp switchbacks,magnificent views and sweeping corners await you. Toward the top take in the road side reflection lake as you begin to see the lunar looking moonscape above the tree line. Stop at the top and visit the ranger station for pictures and refreshments. Then continue down to the Longmire lodge and old hot springs. If your up for a short walk, the trail of the shadows is right there and only about a mile all flat ground. From here you exit the park soon and head out to Elbe. Great burgers at the scale burgers right in the middle of town. Their shakes are incredible! All in all a pretty perfect way to spend your day. on June 9, 2009 1 out of 4 members found this review useful. Maybe enough twisties for the Hog, but not for my Sprint. However, the turns were very civilized, pavement generally good, and provided many opportunities for a quick pass at almost legal speeds. Watch out for Hwy 7 through Spanaway, though, as traffic can drive you bats. on January 5, 2009 1 out of 2 members found this review useful. I rode this route from Enumclaw on the 410 and then back to tacomoa on 7. It was without a dobt one of the most memorable rides I've ever been on. The scenery was incredible and the winding rode through the national forest will give you all the twisting roads you can take.